Horseshoes are known throughout the world as a symbol of good luck. Horseshoes are believed not only to bring you GOOD LUCK, but protect your home and those dear to you. allgoodluck.com is pleased to offer direct to you special “Power of Faith” HORSESHOES which have been approved by our SPRITUAL EXPERTS. “Power of Faith” HORSESHOES are believed to provide luck naturally! “Power of Faith” HORSESHOES are a perfect item to give as a gift to a friend or a loved one. allgoodluck.com “Power of Faith” HORSESHOES are authentic, weathered, and blessed. 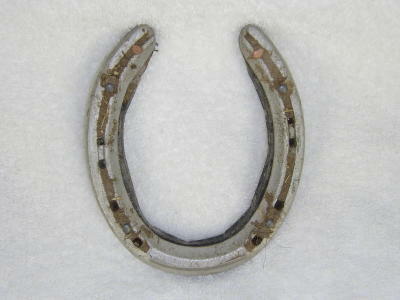 ALL “Power of Faith” HORSESHOES were worn by winning racehorses. You can hang a “Power of Faith” HORSESHOE outside a door entrance, or use as an ornament or paperweight.